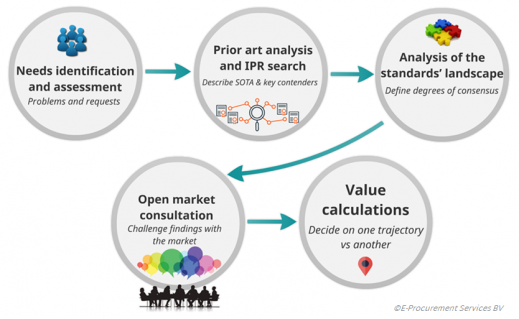 Vtrek helps public agencies to define their end-user needs, identify opportunities and partnering arrangements, define the state-of-the-art, consult relevant markets, and transfer this knowledge into a sound procurement strategy. We assist in developing scenarios by delivering economic realities and legal possibilities. Based on our input, public agencies can select the option which offers the greatest value, reducing risks by innovative solutions. Procurers can become more informed about the feasibility of potential options and steer the development of innovative technologies and services, shaping direct and indirect benefits. This process is captured by the Business Case Methodology, which is summarized in the figure below. The methodology is further detailed by Dr. Anne Rainville and Dr. Ramona Apostol and the eafip Module 2 Toolkit compiled by Corvers Procurement Services with support from Vtrek. Two critical steps in this methodology are the Prior Art Analysis and the Analysis of the Standards Landscape. Together with Corvers Procurement Services, we also offer a range of training modules for procurement professionals and project managers, particularly in the defense and securities sector, for clients including the Dutch Ministry of Defense and Security Research NCP Network (SEREN3). Semi-annual presentations are hosted at the Chair of Innovation Procurement at the Maastricht School of Management; see our news page for upcoming dates and times. For training inquiries, please contact us so we can develop a package that suits the needs of your project or organization.